Crappies are a popular sport fish wherever they are found, and are known for their sweet-tasting meat and the ease of catching them, particularly when they are in the shallows in the spring. But whether they are in water only a foot or two deep, or suspended over water 50 feet deep, the best way to rig for crappies is with a bobber, sinker, and hook. A live minnow completes the presentation. Spool 4- to 6-lb. test monofilament line onto your fishing rod and reel. A long, flexible fishing rod is the best choice since it allows for solid hook sets, but also has enough give that it won't tear the hook from a crappie's mouth. 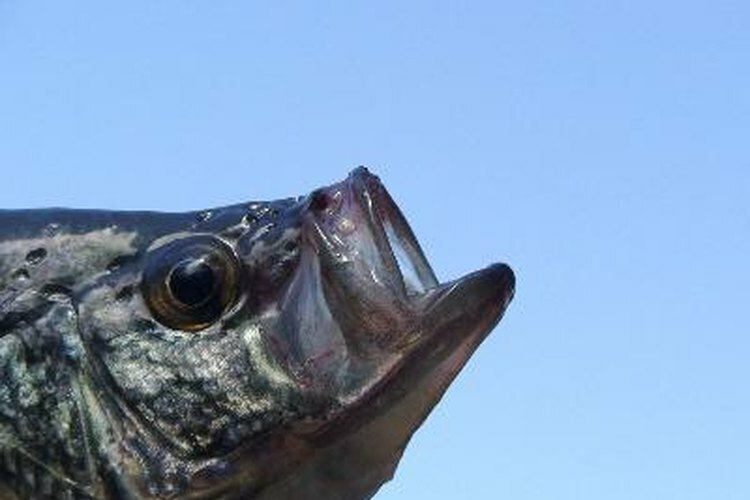 Rod sensitivity is not an issue since the bobber serves as the indicator that a crappie is biting. The best hooks are size 4 or 6, depending on the size of minnow you use. A split shot weight or two and a bobber complete the presentation. The bobber should be small enough that a crappie can pull it under easily, but not so small that the minnow can pull it under. Decide whether you will use a spring bobber (either the ball or pencil-shaped variety) or a slip bobber. A spring bobber is affixed to the line and will not slide up or down, so it is most useful in shallow water. A slip bobber, on the other hand, can be used in both shallow and deep water without affecting anglers' ability to cast. If you are using a slip bobber, slide a bobber stop and a bead onto the fishing line. Then slide on the bobber. Tighten the bobber stop. Tie on the hook you plan to use, and then crimp a split shot or two about 6 inches above the hook. Attach a minnow to the hook. The best way to hook a minnow is just behind the dorsal fin. Determine how deep you want the minnow to swim. If the crappies are in just a few feet of water, the minnow should hang between 6 inches and 12 inches from the bottom. If the crappies are suspended in open water, the minnow should hang at or above the depth at which they are located. If you are using a spring bobber, attach it to the line above the split shot weights. The distance between the hook and bobber should be the distance below the water's surface that you want the minnow to hang. If you are using a slip bobber, slide the bobber stop to the proper location, and then tighten it. The distance between the bobber stop and the hook should be the distance below the surface that you want the minnow to hang.